The expansive work of Clarence Morgan (American, b. 1950) celebrates the malleability of art, rooted in tradition while continually shape-shifting to challenge specific cultural expectations. Throughout his decades-long career as a widely exhibited painter, draftsman, and printmaker, Morgan’s style has gradually evolved from academic representation to biomorphic abstraction, to include pattern, geometry, and the mesmerizing simplicity of “drawing the line.” With masterful technical virtuosity, he subverts self-expression for a broader exploration of the dialectic between systems of order and chaos. A native of Philadelphia, Morgan earned an MFA in painting from the University of Pennsylvania School of Design in 1978. He attended the Pennsylvania Academy of the Fine Arts as an undergraduate, and it was then that he met and married Arlene Burke, who was studying art at nearby Moore College of Art and Design. Partners in life and in art, the couple continues to share studio space in Minneapolis, where Morgan has been a member of the faculty of the University of Minnesota’s Department of Art since 1992, serving as chair from 2004 to 2010. Previously he was a professor at East Carolina University’s School of Art and Design for 14 years. His impressive credentials include appointments as artist-in-residence at the McColl Center for Art + Innovation in Charlotte, North Carolina, and the Harwood Museum of Art in Taos, New Mexico. The recipient of numerous grants and fellowships, he has served as visiting artist at a number of institutions, including Yale University, Oregon State University, Michigan State University, James Madison University, York College of Pennsylvania, Brigham Young University, Cleveland Institute of Art, Cooper Union, Washington University, College of the Holy Cross, University of Wisconsin, Cranbrook Academy of Art, and Stanford University. Morgan has produced prints at Tamarind Institute in Albuquerque, Highpoint Center for Printmaking in Minneapolis, Brandywine Workshop in Philadelphia, and Patton Printmaking Studio/Workshop at the Anderson Ranch Art Center in Snowmass Village, Colorado. The creation of . . . Zelda developed similarly to my other paintings and drawings. By this, I mean that the composition was not a result of a predetermined idea. . . . Because drawing is the underpinning for most of my work, this print began with an abstract linear configuration. I never considered myself a printmaker, but an artist who occasionally works with master printmakers to produce editions from time to time, typically via invitation. These opportunities to collaborate with a master printer have allowed me to experiment and take risks in ways not possible with painting. 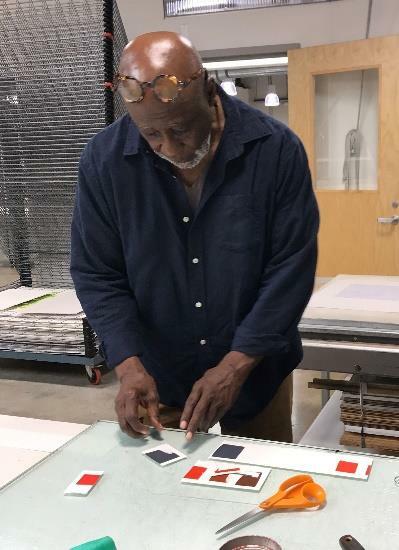 The give-and-take relationship that happens in the collaborative printmaking process relieves pressure in one sense, but also acknowledges the importance of relinquishing control, which can sometimes be a good strategy to advance one’s work. 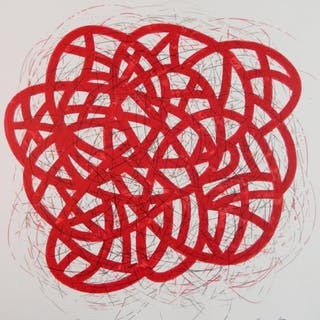 The red color was not initially on my mind; however, as the primary linear form and structure continued to develop, the red color seemed the most obvious way to go. Zelda defies categorization. The forms are familiar yet timeless. The composition is economical yet intricate. The lines are both bold and filigree. The image is clearly nonrepresentational but seems to be coming to life, animated by the color red. Zelda is beautifully controlled chaos. And Zelda is celebratory. The title is the name of Clarence and Arlene’s first grandchild. "Opportunities to collaborate with a master printer have allowed me to experiment and take risks in ways not possible with painting."